GSM Booster is a pin-compatible replacement for Telit GM862-QUAD module while retaining the same form factor of this popular module. GSM Booster contains Telit’s new GL865-QUAD GSM module, MMCX GSM antenna connector, SIM card holder, etc. 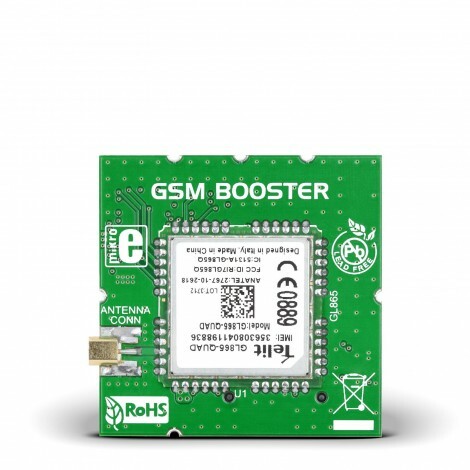 GSM Booster is a pin-compatible replacement for Telit GM862-QUAD module while retaining the same form factor of this popular, yet obsolete module. GSM Booster contains Telit’s new GL865-QUAD GSM module, MMCX GSM antenna connector, SIM card holder and CSTP 50 pin vertical SMD molex connector (male) for further connection. It can be used on MikroElektronika development boards such as SmartGM862, PICPLC16 v6, AVRPLC16 v6, PICPLC4 v6 or EasyGSM/GPRS GM862. There are four zero-ohm SMD jumpers used to select whether Handsfree (HF) or Handset (MT) audio pins are used. Jumpers are soldered in the HF position by default. SIM card and GSM antenna are not included in the package.